So often lately my book reviews have included the words “This book took me a really long time to get into.” Although I’ve read some good books lately, it’s been awhile (at least since Christmas break when I read The Ice Cream Queen of Orchard Street) since I’ve had that wonderful experience of picking up a book that I could hardly bring myself to put down because I was immediately so absorbed in it. That happened to me this past weekend when I started Farthing by Jo Walton on Saturday night, and had finished all three books of the trilogy by the time I went to bed Tuesday. Farthing starts off like a typical English country house murder mystery, set in 1949 among the upper class family and visitors at a stately Hampshire home called Farthing. But the reader quickly realizes (or would, if she hadn’t been tipped off by any review or cover blurb of this book you’re ever going to read, so this isn’t a spoiler) that this is not 1949 as we know it. This is an alternate-history timeline, a 1949 in which Britain has not fought Hitler and the Nazis to defeat but rather sealed the Battle of Britain with a 1941 peace treaty. Now, in the 1949 of this story, Britain is on friendly terms with the Third Reich, which now governs all of continental Europe. Churchill has been pushed out of power by the “Farthing Set,” an influential group of politicians centred around this very country house where the murder of a prominent lord has occurred. In this version of postwar Britain, fascists are your friends, and your friends may well be fascists. Jews in England, while they aren’t being sent off to death camps as they are on the Continent, are subject to much more overt and blatant racism than in the 1949 we’re familiar with — which becomes apparent when we realize that one of the key suspects in the Farthing murder is Jewish. Meanwhile, Inspector Carmichael, who comes to investigate the Farthing murder, has his own reasons for wanting to keep his private life out of the public eye, since Jews aren’t the only people who find it more prudent to keep a low profile under this regime. The murder mystery is solved in Farthing, but its repercussions continue to echo through the two sequels. 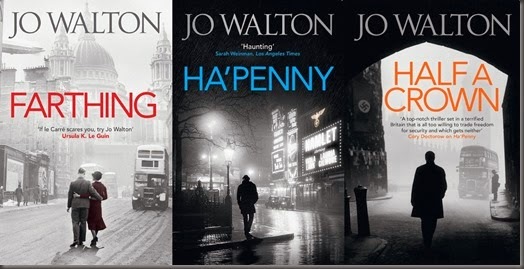 Ha’penny and Half a Crown are not mysteries in the same sense that Farthing is; though each book starts with an act of violence, the later two books are more like thrillers or political intrigue. Each book introduces us to a new cast of characters, though Inspector Carmichael and those closest to him remain at the centre of every story. As events in this alternative Britain (and the world around it) unfold from 1949 to 1960, we’re treated to a chilling and cautionary tale of how people who pride themselves on their freedom can surrender it, bit by bit, hardly even noticing it’s gone until it’s too late. There are a few plot holes here, particularly in the last book which has so much plot to tie up in a short time, but given the scope of the story I thought the resolution was mostly successful, and I never stopped turning pages, wanting to know how each individual novel’s story would be resolved but also to know where the overarching story would lead — could Britain be saved from turning into a totalitarian dictatorship? I started reading this highly-acclaimed historical debut novel several weeks ago, but found it slow to get into and let it languish for awhile as I was reading other things. When I came back to it a few days ago I quickly found that the story picked up interest and I raced through to the end. While the setting — a merchant’s home in late seventeenth-century Amsterdam — was meticulously researched and beautifully depicted, and the plot definitely picked up in the second part of the book, I never did feel deeply emotionally engaged with the characters. The set-up should be great, and the story sometimes is — Nella, a naive eighteen-year-old country girl, comes to Amsterdam as the wife of a much older man in a household full of people guarding secrets, and of course you want to know what will happen. Why is her husband so cold? What is her sister-in-law hiding? 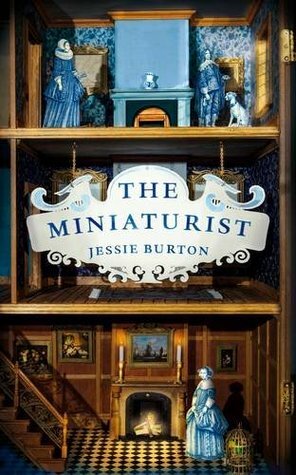 Why does a mysterious maker of miniatures keep sending her dollhouse furniture that is just a little too weirdly accurate a reflection of what’s going on in Nella’s house? The novel is very well-executed, but it wasn’t as engaging to me as it could have been and I’m not entirely sure why. Some reviews have read have suggested that Nella suffers from a complaint common to heroines of historical novels: being written as if she were a twenty-first century feminist dressed in seventeenth-century gowns, and there may be some truth to that. Whatever the reason, I enjoyed visiting the world of Amsterdam as it was recreated in this novel, but wished I had been more emotionally caught up in the story. I’d heard quite a bit of buzz about this book before I picked it up, but not so much that I actually knew what it was about. After a bit of a slow start I got quite drawn into it and found it hard to put down. It tells three stories, two of which are really compelling (I could have lived without the third). Against the backdrop of the German occupation of France in the Second World War, we meet two intriguing young people. Werner, an orphaned German boy, grows up in a children’s home with his sister Jutta as his only close companion. His fascination with, and skill at, tinkering with electronics (especially radios) gives him a role to step into when war comes. 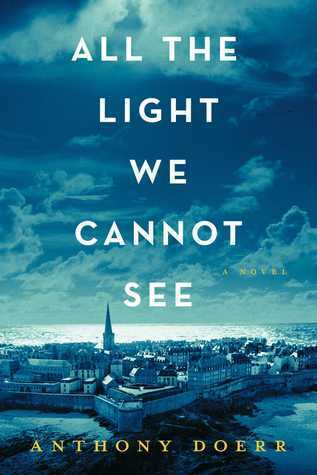 At the same time, Marie-Laure, blind from early childhood, grows up in Paris with her father, a museum locksmith, who may or may not have been given an unbelievably valuable diamond with a curse on it to guard when the advance of the German army forces them to flee Paris. It’s inevitable that Marie-Laure’s path and Werner’s cross, though where and how is hard to predict. As Werner’s story unfolds, we see the chilling reality of young boys being shaped into killers under the Third Reich’s ruthless philosophy; in Marie-Laure’s chapters we experience the fear of living in an occupied country and the desperate courage of the French Resistance. In between, we get occasional chapters from the perspective of a German officer who is hunting for the precious diamond that Marie-Laure’s father may or may not have smuggled out of Paris — these are the chapters I could probably have done without, although they do provide some tension and suspense near the end of the story. This was a beautifully written, occasionally haunting novel that offered me two new perspectives on the well-known story of the Second World War. While I didn’t find the ending as ultimately satisfying as I had hoped, the journey there was more than worth it.